No, not Wallace and Gromit, but a cautionary tale from the Norwich papers of 1775. It seems even the good people of Holt in Norfolk were not averse to a ‘bit on the side’. The following odd affair happened at Holt. A man in this parish went home and finding his wife in bed instantly undressed and got into bed with her: she complained she was very bad with the colic, begged him to rise and fetch her a little gin or she should die. The husband rose, went to the neighbouring alehouse, called for a quart of gin, which being brought to him, he pulled a guinea out of his pocket and asked for change. The landlord told him he could not give change for a guinea. 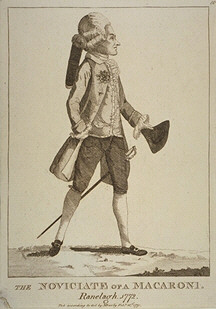 ‘Guinea’, replied the man with surprise, ‘I am sure you mistake, for I had only a shilling in my pocket.’ The man viewed it with amazement and dipping again pulled out three more, and looking downward found to his comfort he had got a pair of maccaroni breeches on. This entry was posted in C18th Norfolk, Georgian Society, Tid-bits. Bookmark the permalink.